Isaiah 65:16 – Whoever invokes a blessing in the land will do so by the God of truth; he who takes an oath in the land will swear by the God of truth. For the past troubles will be forgotten and hidden from my eyes. The Latin Hippocampus is from Ancient Greek ἱππόκαμπος (hippokampos), from ἵππος (hippos, “horse”) and κάμπος (kampos, “sea monster”). All humans have Ammon’s horn which is two hippocampi, one in each side of the brain which is a part of the cerebral cortex, and in primates is located in the medial temporal lobe, underneath the cortical surface. It contains two main interlocking parts: Ammon’s horn and the gyrus. Let me help illuminate for you exactly where Amon (the hippocampus) is located in your brain. At the top of your brain under the two hemispheres of the cerebrum is part of the brain called the cerebellum. Under the cerebrum and cerebellum is where you will find your brain stem, that which connects the brain to the spine. Lying in the middle of your brain is part of the temporal lobe called the hippocampus or Ammon’s horn. 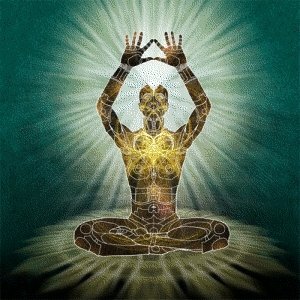 In meditations, the hippocampus is what we humans use as a mode of astral travel. 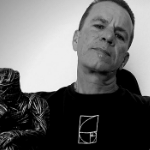 In addition, I believe that the hippocampus stores past-life experiences and is that part of the brain we access for ‘past life’ recognition. The hippocampus is critical for the formation of new autobiographical and fact memories. Hence, this section of our brain is how we remember not only past events or locations, but also past lives, and the High Priests of Jupiter Ammon knew this. From Wikipedia – In the New Kingdom, Amun became successively identified with all other Egyptian deities, to the point of virtual monotheism (which was then attacked by means of the “counter-monotheism” of Atenism). Primarily, the god of wind Amon came to be identified with the solar god Ra and the god of fertility and creation Min; so that Amun-Ra had the main characteristic of a solar god, creator god and fertility god. 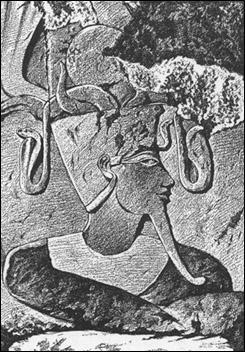 He also adopted the aspect of the ram from the Nubian solar god, besides numerous other titles and aspects. As Amun-Ra, he was petitioned for mercy by those who believed suffering had come about as a result of their own or others wrongdoing. It was in the Siwa Oasis at the Temple of Umm Beda (Um Ebeida), where Alexander the Great became the “Son of Amon.” The oasis was the seat of the Temple of Amon (Zeus or Jupiter Ammon). 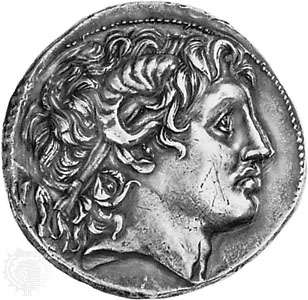 The picture to the right is a coin with Alexander the Great where his Amon’s Horn can clearly be seen. The magical hippocampus is the serpent-god of the sea. It appears with the head and body of a horse and large fishlike sea serpent hindquarters. Hippius, a name of Neptune; the Hippocampus was Neptune’s favorite horse. Neptune (Latin: Neptūnus) was the Roman god of water and the sea in Roman mythology and religion, a brother of Jupiter and Pluto. 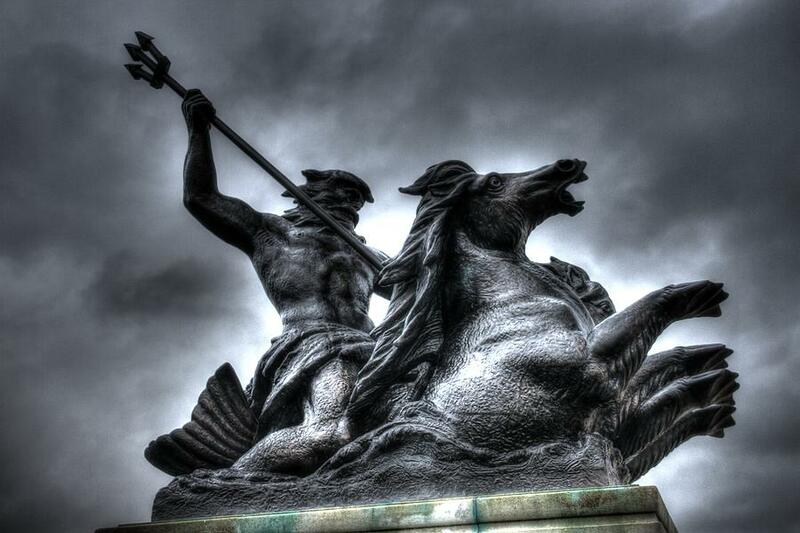 He is the counterpart of the Greek version and one of the ancient gods of Phoenicia under the name of Poseidon. Neptune or Poseidon, is often riding a hippocampus or has his chariot drawn by two of them; his babies are called tadfoals. Scylla, the sea monster or Jonah the Great Fish. Several early church fathers believed that the “whale” which swallowed Jonah was the symbol of God the Father, who, when the hapless prophet was thrown overboard, accepted Jonah into His own nature until a place of safety was reached. The story of Jonah is really a legend of initiation into the Mysteries, and the “great fish” represents the darkness of ignorance which engulfs man when he is thrown over the side of the ship (is born) into the sea (life). The custom of building ships in the form of fishes or birds, common in ancient times, could give rise to the story, and mayhap Jonah was merely picked up by another vessel and carried into port, the pattern of the ship causing it to be called a “great fish.” (“Veritatis simplex oratio est!”) More probably the “whale” of Jonah is based upon the pagan mythological creature, hippocampus, part horse and part dolphin, for the early Christian statues and carvings show the composite creature and not a true whale. Amon has also been associated with the biblical Ham (Cham), Hammon or Rammon. 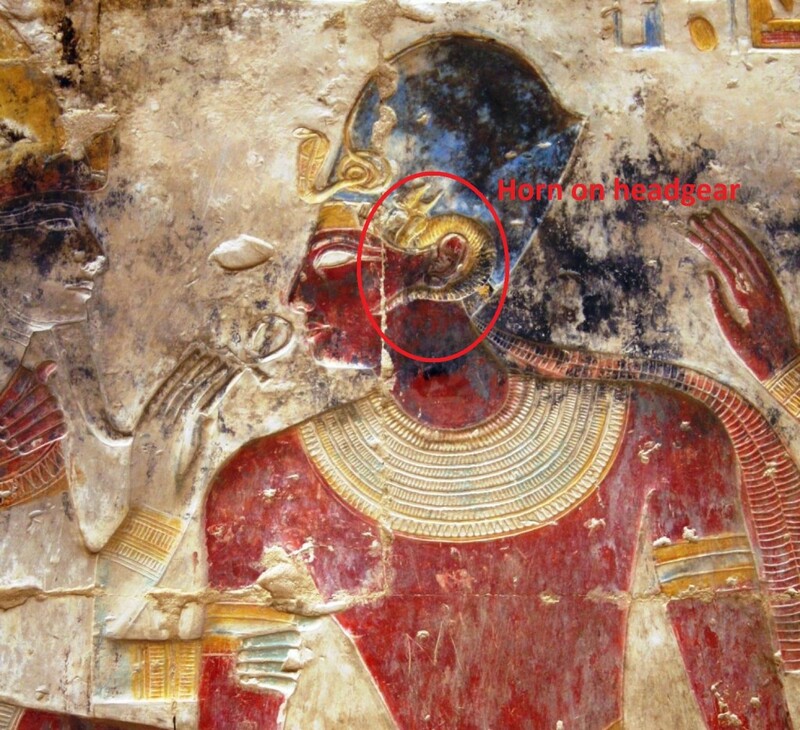 The connection being from Ham or Hammon to Ammon that we also find in Ram-mon or Ram-ses, and then of course the Ramses Dynasties. These fascinating connections I will detail further in a future article, but for now, I will leave you this image of Seti I at Abydos. Amun (also Amon, Amen, Greek Ἄμμων Ammon, Ἅμμων Hammon) was a local deity of Thebes. He was attested since the Old Kingdom together with his spouse Amaunet. With the 11th dynasty (ca. 21st century BC), he rose to the position of patron deity of Thebes by replacing Monthu. excellent article, Moe. A really good read. I have never herd before of the horns of Amon, and the link to the horn like stems of the hippocampus is just brilliant. With Zeus/Jupiter (consciousness) riding one side and Poseiden/Neptune riding the other. Great stuff. Thanks so much for the kind words Senan. I sincerely appreciate that. To the best of my knowledge, I was the first person ever to make these connections. I have long pondered Amen. Revelations 13:14: These are the words of the Amen, the faithful and true witness, the ruler of God’s creation. Revelations 3: 14 These are the words of the Amen, the faithful and true witness, the ruler of God’s creation. 21 To the one who is victorious, I will give the right to sit with me on my throne, just as I was victorious and sat down with my Father on his throne. Nehemiah 8: 6 Ezra praised the LORD, the great God; and all the people lifted their hands and responded, “Amen! Amen!” Then they bowed down and worshiped the LORD with their faces to the ground. It appears that once again modern day Jesus religion converted the God Amen to mean Jesus.